Next stop was our home for the evening, the Denali Park Lodge. It’s a beautiful lodge right own the river and the view of the mountains is priceless. The lodge is a log cabin style with nice balconies complete with table and chairs to relax in. Rooms are very modern, have lots of storage space and very comfortable beds. Showers were great with a bath that was the largest so far on this trip. We stayed in the east wing which is the wing used for both Royal Caribbean and Celebrity tours. The lobbies had lots of seating space and large picture windows with great views of the mountains. In front of the windows, a map is displayed showing all of the mountain ranges and their names. We had a 6:15am early call for our trip into Denali National Park so, it was an early evening after the Denali Dinner Theater show (lots of fun) later that night. The highlight of this trip was our venture into Denali National Park. Our bus was there on time and off we went. Our driver, Aaron, said he hoped that we would be able to see Denali. It was a beautiful, sunny day and the mountain came out in all of her amazing glory. 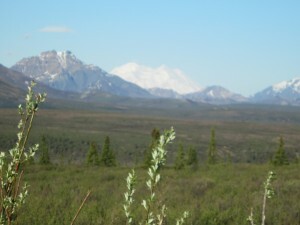 Aaron said that we were lucky as only about 30% of people who come to Denali National Park actually see the mountain. We also able to see a wild wolf, moose, caribou. We spent four hours in the park, made a couple of informational stops and then headed to the Denali train station. Up the hill from the train station you can visit the Denali information center. This is a must as you can see and learn more about the Denali National Park. 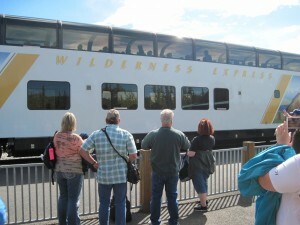 We left on the Wilderness Express for the four hour trip to Talkeetna. 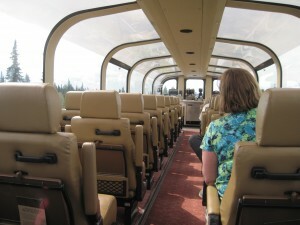 The staff on the Wilderness Express are great and the train ride was very relaxing. The food onboard was very good and prices are about what you expect to pay in Alaska. They serve breakfast, lunch or dinner depending on when you board the train. Talkeetna is a town that many of the mountain climbers will use a home base before they go off on the climbs. There are no stoplights in the town and buses are not allowed into the main street of the town. If you didn’t take any adventure tours on your cruise this is the town where you can go crazy with flight planes, river rafting, jet boats, ATV’s etc. We stayed at the Talkeetna Alaskan Lodge out of town but those that want to walk to town beware of the mosquitos and I would say it is about a 3 mile walk. The resort again has very nice rooms, great bath facilities and beautiful views. We had a late afternoon departure to Alyeska (Girdwood). This, I must say, was the best resort of all that we had the opportunity to stay at. This hotel will take your breath away once you enter the lobby. It is AAA four diamond resort and many in our group said we have died and gone to Alaska heaven. It has over-sized rooms, great views, indoor salt water pool and Jacuzzi, many restaurants, shopping and the best was the tram to the top of the mountain to explore the 7 Glaciers restaurant and bar. The mountain still had a little snow. During the summer it is busy with hikers and during the winter it’s very busy with skiers. I hated to leave this resort. The resort does offer shuttle service into the town of Girdwood where you can experience Alaskan “nightlife” and grab a meal. After a couple of stops at the Alaska Native Center and a lunch and tour of the Anchorage Museum, we made it to our last stop–Anchorage. There was so much to see and experience at both of these locations. It is definitely a must see in Anchorage. At the Alaska Native Center I even got to ride on a dog sled trainer. It was a blast. We spent the night at the Anchorage Marriott and it is just what you’d expect from all other Marriott hotels in the lower 48. Denali National Park and the ride on the Wilderness Express are definite highlights on this tour. Always remember that since Denali has its own weather system, it’s never guaranteed that you’ll be able to view it. This entry was posted on Tuesday, June 24th, 2014 at 9:58 am	and is filed under Adventure, Alaska, Celebrity, Celebrity Cruises, Cruise, Cruisetour, Hotel, Royal Caribbean, Tour, Train Travel, Travel Agent. You can follow any responses to this entry through the RSS 2.0 feed.